For those of you who can't wait for our next concert, or perhaps haven't had a chance to hear the band before, here is something to whet your appetite. 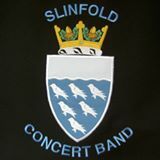 "Tribute to Count Basie" is one of Slinfold Concert Band's favourite numbers, it is a medley arranged by John Moss featuring "All Of Me", "Corner Pocket", "Li'l Darlin'" and "April in Paris". The trumpet solo in "Li'l Darlin'" is played by Moshe Ibelo, the Band's principal trumpet. Recorded in April 2015 and with thanks to Jo Luckman for putting together the montage for YouTube.